Fernmark is owned and managed by two women committed to creating a welcoming and special retreat for all of Fernmark's guests. Hallie & Corinne's enthusiastic caring service will strengthen every notion you have of bed & breakfasts as wonderful places to stay. Corinne is a wholistic health practitioner and has a post-grad in Counselling with a view to working in Equine Assisted Psychotherapy. Corinne is originally from Melbourne but lived overseas for most of her adult life while completing Theatre Studies & Acting training at Hebrew University in Jerusalem and then working in the theatre. She returned to Australia to open the Fernmark Inn and finally live in the bush, with Hallie, dogs, horses, and all the other farm animals... chooks, cows, goats and alpacas! Hallie is originally from upstate New York. After receiving her degree in International Hotel Management at Florida International University, she worked for over 30 years in hotels including Hawaii, Egypt, Rome, Israel, England, Canada and all over the United States. Front office, food & beverage operations, accounting and marketing are all areas she has worked in, qualifying her to run with Corinne their five room Inn par excellence! Now she enjoys woodturning, ceramics, hanging with the animals and gardening! Mollee is our gorgeous dog - Bull Arab Mastiff a rescue dog from Animal Welfare League. She is friendly and welcomes our guests every time you arrive. Our four horses are just gorgeous and are trained in Parelli Natural Horsemanship. Mojo is a 5 year old rescued retired race horse thoroughbred, Gem is a 16 year old Paint horse, and Rusty, our newest brumby addition to the family. 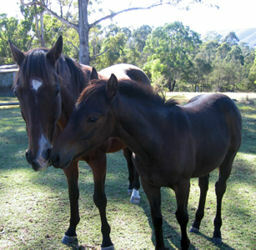 We bred Shemesh ourselves from her thoroughbred mum, Lady Moran (Eilat) and her stockhorse dad – Crab. She is something special! And a bunch of chooks that thankfully have not been named!! !